Photo: Christmas in the Z. N. Barnes Home, Little Falls, MN, c. 1900. 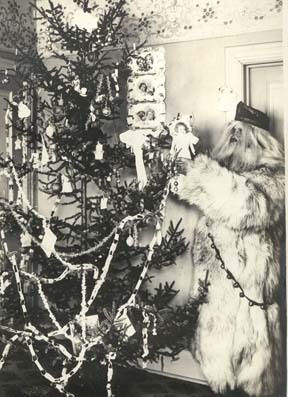 The camera has captured Father Christmas leaving a doll on the tree for Mildred, daughter of Mr. and Mrs. Z. N. Barnes. Father Christmas is portrayed by Mildred's "Uncle Rob," Rob McCollough. Photo by Z. N. Barnes from the Morrison County Historical Society collections. Ooooh, he’s so scary. He’s creepy. No way, that’s not Santa. How did he get his picture taken; I thought Santa wasn’t supposed to be seen? He’s ugly. He looks like an abominable snowman. Each spring, the museum welcomes a slew of school groups from across the state. This year’s group of students was no different from those we have hosted in the past. They were unique, however, in their seemingly uniform fascination with a photograph of Santa Claus that is on display in the J. C. Patience room. While there is no greater reward for a tour guide than a barrage of questions, dealing with the “facts” of a famous figure such as Santa can be somewhat daunting. This year’s focus sent me on a mission of exploration into the history surrounding this popular guy. What I discovered was a character of extraordinary flexibility and adaptableness who, not surprisingly, readily reflects the never-ending richness and diversity of our world. I will freely admit that a lot of my understanding of Santa comes from those wonderful Christmas specials that were created and produced by Arthur Rankin and Jules Bass. The continuing popularity of shows such as “Rudolph The Red-Nosed Reindeer” (first aired in 1964) and “Santa Claus Is Comin’ to Town” (first aired in 1974) is a good indication of how many people view Santa. How else would he appear other than as a jolly fat man who wears a red suit and sports a full white beard and bushy eyebrows? While this image seems quite straightforward, a brief look into Santa’s past suggests otherwise. Santa is actually a melding of a variety of traditions and beliefs that, even today, vary depending on culture and/or country. Santa’s origins have been traced to a monk named Nicholas who was born in 280 AD near Myra in modern-day Turkey. According to legend, Nicholas was a kind, pious man who gave away all his inherited wealth and traveled the countryside helping the poor and sick. Nicholas is the patron saint of various sites across the world, including Russia, Greece and New York City. He also serves as the patron saint for children and sailors. There are many different legends associated with Santa and his life. While all describe him as a generous, loving, kind-hearted man, they vary as to his appearance and his helpers. Two of his less well-known assistants, Knecht Ruprecht and Pelsnickle, are somewhat frightening characters. Each carries a rod or switch which is used to “reprove” naughty children. Knecht Ruprecht (“Servant Rupert”) is also known as Black Peter. The name “Black Peter” was acquired as a result of all the trips he makes up and down soot-filled chimneys to deliver presents. In some areas, Knecht Ruprecht and St. Nicholas have been merged to form one figure. This figure is known as either Ru Klaus (“Rough Nicholas”) from his rugged appearance, Aschen Klaus (“Ash Nicholas”) from the sack of ashes he carries, or Pelznickle (“Furry Nicholas”) from his fur clad appearance. Another companion, Christkindl or Christkinlein (“Christ Child”), is a much less frightening helper. In many countries, Christkindl is portrayed as an angelic fair-haired young girl. It wasn’t until the early nineteenth century and the publication of Clement Clarke Moore’s poem, “A Visit from St. Nicholas” (“The Night Before Christmas”), that Santa Claus seems to have permanently acquired his jolly plump aspect. Prior to this, Santa could be anywhere from tall and thin to short and robust. In Moore’s poem, Santa was pretty tiny and rode in a miniature sleigh that was pulled by eight tiny reindeer. It is not hard to imagine Moore’s diminutive figure making his way up and down the chimneys of the world. During the middle of the nineteenth century, the “modern” view of Santa was strengthened by the images that were produced for Harper’s Weekly by Thomas Nast, a popular illustrator and political cartoonist. Nast’s rotund Santa was a jolly fellow who wore a bright red fur-trimmed suit and lived at the North Pole. Nast’s version included the ever-reliable Mrs. Claus and the indispensable workshop that is operated by lots of busy elves. The Coca-Cola company played a major role in cementing the “modern” image of Santa during the twentieth century. Beginning in 1931, Coca-Cola began an ad campaign that focused on increasing winter sales. The ads featured a human-sized portly Santa who gleefully shows off his wonderfully ruddy complexion. These memorable ads were created by the commercial illustrator, Haddon Sundblom. Sundblom’s drawings quickly associated Santa with the company’s main product, Coca-Cola. The success of this campaign was so great that today many people believe the Coca-Cola company actually created the “modern” Santa. The figure featured in the photo that so fascinated this year’s school tour groups does not fit the “modern” image of Santa Claus. Though this fur-clad man with his full head of hair and bushy beard looks more like Pelsnickle than Santa, he does manage to suggest the wealth and extraordinary diversity of this ubiquitous figure. No doubt Santa will continue to evolve and change with the times. Maybe that’s the secret to his longevity and his continuing popularity across the world. Way to go Santa! According to Russian legend, the three wise men asked an elderly woman named Babouschka for directions to Bethlehem. The woman purposely gave them the wrong directions. After a change of heart, she attempted to find the wise men to correct her mistake, but did not have any luck. Every year, on January 5, Babouschka leaves gifts for Russian children in the hopes that one of them is the baby Jesus and she will be forgiven. In Italy, lucky children receive toys from a kindly witch named La Befana. La Befana rides a broomstick down the chimneys of Italian homes to place toys in children’s stockings. One of the best known of the many legends surrounding the figure of St. Nicholas is how he saved three poor sisters from being sold into slavery or prostitution by their father. In order to provide each of the sisters with a dowry, which would enable them to be married, St. Nicholas threw three bags of money through the window of their home. Nicholas’s feast day, December 6, has traditionally been considered a lucky day to make large purchases or to get married.